London police arrested another man in connection with this month’s brazen jewelry store robbery of some $65 million worth of gems, Metropolitan Police said. The arrest on Thursday came a day after two men were taken into custody in connection with the crime, police said. Officers continued to appeal for information about the robbery. Last week London police arrested a 50-year-old man in connection with the August 6 daylight robbery, though he was released on bail. It was not clear whether police thought that man was one of the two robbers, whom they had described as appearing to be in their 30s. 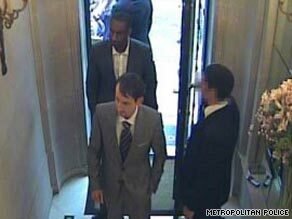 The August 6 robbery involved men in suits and ties who walked into the Graff jewelry store on central London’s New Bond Street late in the afternoon and threatened employees with handguns, police said. Forty-three items were taken, including rings, bracelets, necklaces and watches, Scotland Yard said. The robbers left in a blue BMW, which they abandoned nearby, switched to a silver Mercedes, then to a black vehicle, possibly a Ford or Volkswagen, police said. Police described one of the robbers as white, about 30 years old and 5 feet 10 inches to 6 feet tall. The second is a black man believed to be in his 30s with short hair. Both men are thought to have spoken with London accents, Scotland Yard said. The robbery is the latest in a spate of daytime thefts at jewelry stores and designer shops in London’s exclusive shopping areas of Bond Street, which includes New Bond Street. Groups of men or teenagers typically stage “smash and grab” robberies, in which they break the windows and steal anything they can get their hands on before speeding away in waiting cars or motorbikes. The thieves strike during the day, when store security systems are typically disarmed, even though the store and sidewalk may be crowded with people.